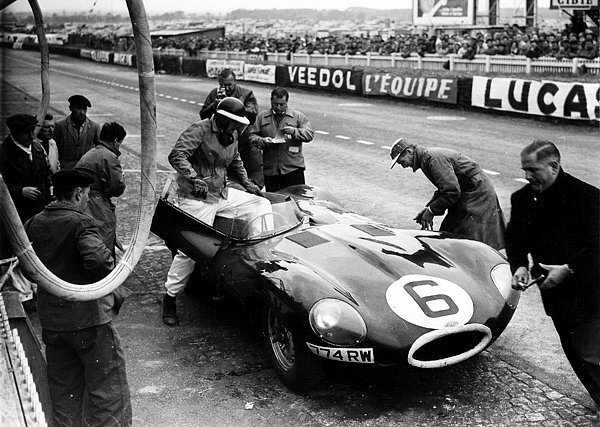 Between 1950 and 1959, 24 hours of Le Mans was dominated by British built and designed Jaguar cars. Five of the 10 races were won with drivers in Jaguar cars, including a hat-trick between 1955 and 1957 for the Jaguar D-Type. However, the decade began in 1950 with a hugely popular victory for a home French team, Louis Rosier and his son Jean-Louis Rosier, driving a Talbot Lago Grand Sport T26. Another Talbot Lago T26 secured second place for another all French team of Pierre Meyrat and Guy Mairesse. 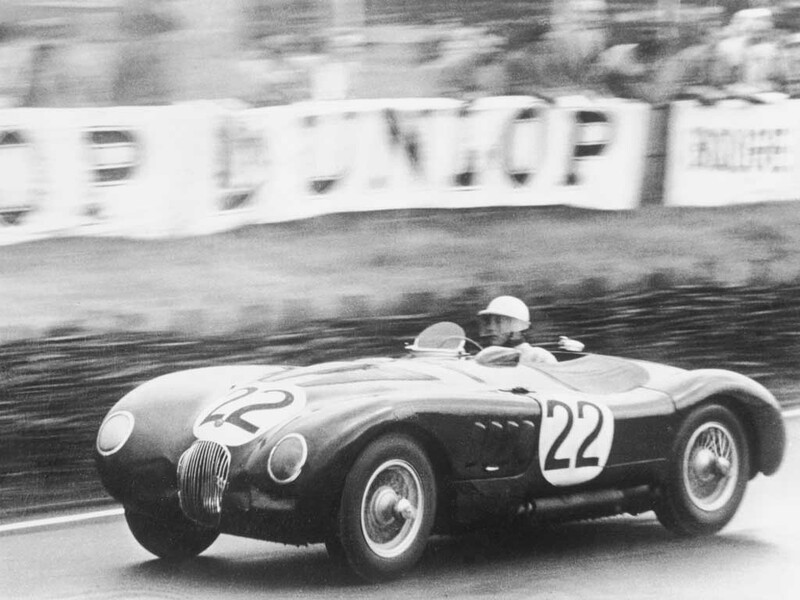 The first victory in a Jaguar car took place in 1951, when Peter Walker and Peter Whitehead drove a Jaguar XK120C. The 'C' notation meant competition and the XK120C used the running gear of the road proven and popular XK120 in a lightweight frame and aerodynamic body. The factory entered three Jaguar XK120Cs, all appearing for the first time, but only one finished and in first place. 2018 marks the 70th anniversary of the launch of the Jaguar XK120 and it was celebrated at the XK70 Jaguar Festival in June 2018. Damiler-Benz secured the 1952 Le Mans with a Mercedes-Benz W194. However, the trophy returned to the United Kingdom and Jaguar in 1953 when Tony Rolt and Duncan Hamilton won in a Jaguar C-Type, the first cars ever to race at Le Mans using disc brakes. The team was also the first to exceed 300 laps. Three Jaguar C-Types had been entered, all finishing in the top four. 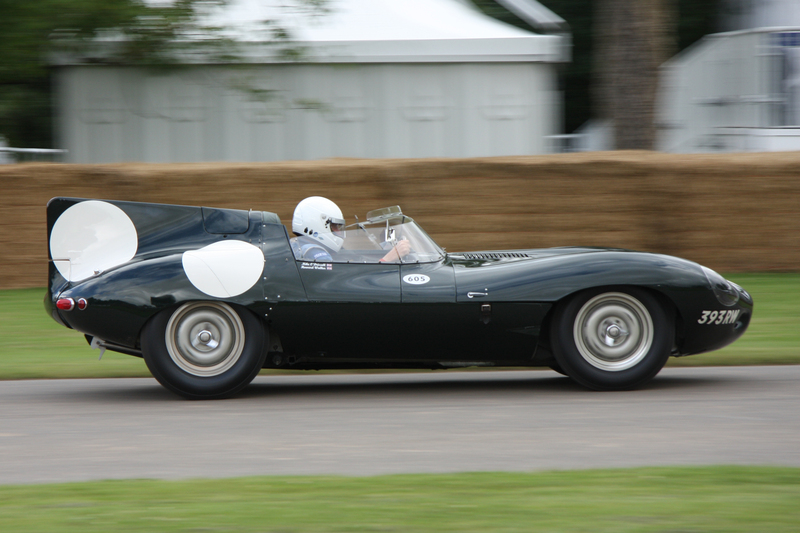 In second place was Sterling Moss and Peter Walker in a Jaguar C-Type and they also reached the 300 lap mark. Ferrari secured the first of two 1950s 24 hours of Le Mans victories in 1954, but the Jaguar cars dominance resumed in the tragic race of 1955. Mike Hawthorn and Ivor Bueb guided a new Jaguar D-Type to victory in a race marred by one of the most terrible motor racing accidents in history. Mercedes driver Pierre Levegh and more than 80 spectators lost their lives when the car launched into the air, crashing into a retaining wall, disintegrating and scattering debris into the crowd. The 1956 Le Mans race was also won by a D-Type, but managed by the Scottish Ecurie Ecosse team and not the Jaguar factory entry. Ron Flockhart and Ninian Sanderson beat off strong competition from an Aston Martin DB3S, driven by Sterling Moss and Peter Collins, and a Ferrari 625 LM. Ironically, the most successful year for Jaguar cars came after Team Jaguar had withdrawn from motorsport at the end of 1956. In the 1957 Le Mans race, five of the top six places featured D-Types with Ron Flockhart returning with a new driving partner, Ivor Bueb, to guide the Ecurie Ecosse team to first place for the second consecutive year. The team also eclipsed the previous record number of laps completed, recording 327. Ecurie Ecosse also came second, with two other Jaguar D Types finishing third and fourth. This was the last time a Jaguar would win at Le Mans until 1988. Ferrari's second success of the decade came in 1958 with a Ferrari 250 TR58 winning in atrocious wet weather conditions. The final race of the 1950s was won by another British motoring legend, Aston Martin. Under the David Brown Racing Dept team, American Carroll Shelby (of AC Cobra fame) and Brit Roy Salvadori skilfully steered an Aston Martin DBR1 around the Le Mans track, to secure the car's first and only victory in the race. The 1950s was a golden year for British motorsport. Six of the ten winning cars in the 1950s featured SMITHS instrumentation and gauges in their dashboards. SMITHS had a long standing relationship with both Jaguar and Aston Martin, designing and manufacturing gauges from their facility in the UK. Caerbont Automotive Instruments, the present owners of the SMITHS brand, still have the original drawings and tooling used to manufacture the SMITHS gauges for the Jaguar XK120C, Jaguar D-Type and the Aston Martin DBR1. SMITHS gauges are still manufactured and supplied for classic Jaguar and Aston Martin car enthusiasts all over the world.